Samsung has unveiled the Galaxy S8 and Galaxy S8+ today, going into the details of all of the new features that the flagship provides. It has officially confirmed today that the Galaxy S8 features an iris scanner which brings yet another way to secure access to the device. It’s interesting to note that the Galaxy S8 offers five security features with which you can protect your device, that’s more than what any other device offers right now. The first is the iris scanner which creates an eyeprint of the user to control access to the device. Then there’s the fingerprint sensor which now resides at the back of the device. Samsung’s new flagship even has facial recognition which quickly provides access to the device when the user picks up the phone. It retains the conventional Android security features such as pattern and password which can also be used to control access to the phone. 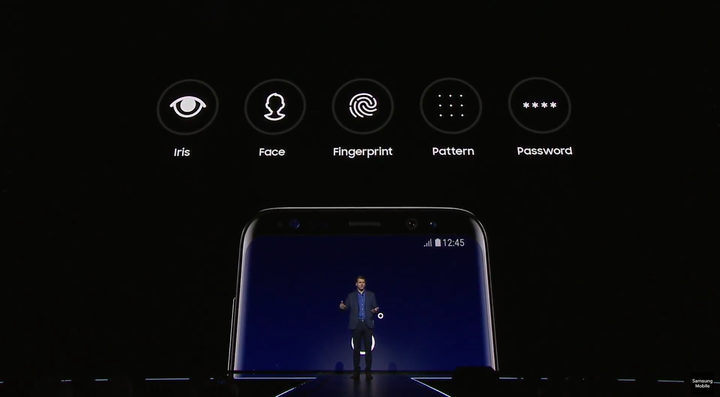 So the Galaxy S8 offers Iris, Face, Fingerprint, Pattern and Password features for access control. That’s impressive, to say the least. Which one do you prefer the most? Let us know in the comments below. Don’t forget to check out our hands-on of the Galaxy S8 and Galaxy S8+. Would of been nice if the finger-print scanner was added onto the screen itself, but pehaps next years version may have it?